I love a good tragic love story, and it doesn't get much more tragic than an interracial couple in 1918 South Carolina. 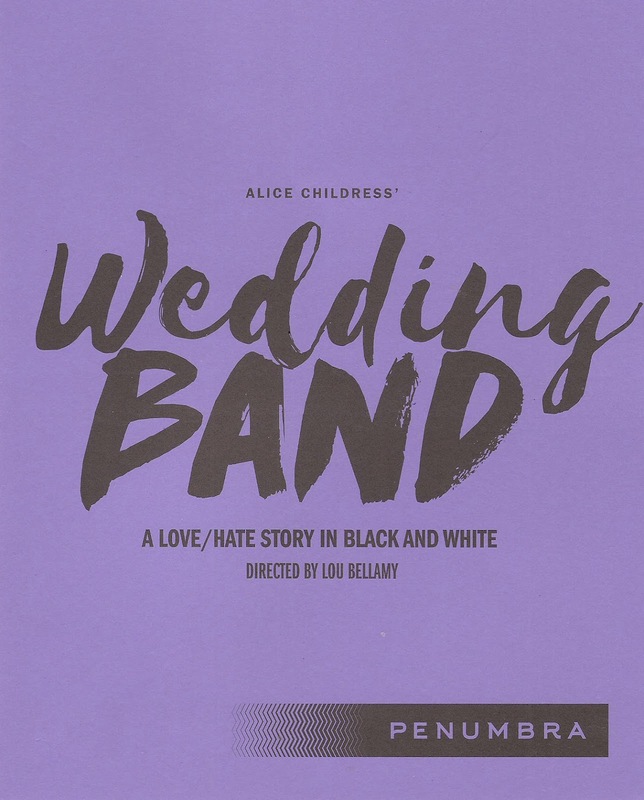 But Penumbra's gorgeous production of the 1966 play Wedding Band by Alice Childress (whose Trouble in Mind was seen at the Guthrie last year) is not just a beautiful, complicated, and ultimately tragic love story. It's also (not unlike Trouble in Mind) a still timely work that speaks to the issues of race, racism, and privilege in ways that feel entirely relevant. 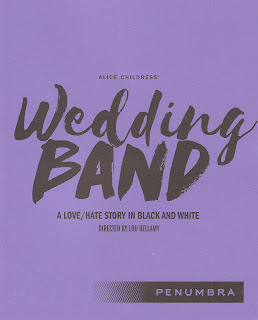 With a super talented cast directed by Penumbra's founder Lou Bellamy (who recently passed the Artistic Director baton to his daughter Sarah) and gorgeous design, Wedding Band is a show not to be missed, and my favorite of my five-show weekend. Into the backyard of a quiet black neighborhood in a South Carolina town, a woman with a secret arrives. Julia's secret is that she's been in a relationship with a white man for ten years. Because of the laws of the time, Julia and Herman cannot marry, and dream of moving somewhere they can be free to live together as husband and wife. Until then, Julia keeps to herself and moves around a lot; if the wrong people discover her secret, it could be deadly for both of them. But she's lonely, and decides to let her guard down and share her life with her new neighbors, including proud landlady Fanny; Lula and her grown son Nelson, on a brief leave from the war; and hard-working Mattie, awaiting her husband's return from the war. While they like and support Julia, they're none too pleased at this revelation, because they know it means trouble. And trouble arrives when Herman visits Julia, as he has done for ten years, and comes down with the deadly wartime flu. Calling a doctor would alert the authorities to their illegal doings, so instead they ask Herman's bigoted mother and sister to come. They do, but they refuse to take him to the doctor until nightfall. Through discussions with her neighbors, Herman's family, and the direness of Herman's illness, Julia comes face to face with the issues she's been avoiding for ten years. This is not a love story that's allowed to have a happy ending. Twin Cities Theater Bloggers' favorite dramatic actor of 2016, Darius Dotch, gives another strong performance here as Nelson. Bob Beverage is perfectly creepy as the white man selling trinkets in the neighborhood. Laura Esping is fierce as Herman's mother and goes full force as the most despicable character in the play, while Jen Maren as his sister is a bit softer and more pragmatic. Last but not least, the young girls Frances Ronning, Nia Stiggers, and Maya White are adorable and play out the issues of the adults in a smaller way. The entire play takes place in Julia's rented room, the neighbor's front porch, and the space in between. Julia's homey room is on a raised platform without walls on the right, the porch on the left, allowing us to see into all spaces at all times. The lighting beautifully reflects the place and time of day, and there's something bittersweet about the tall tree above Julia's room silhouetted against the colored background (scenic design by Vicki Smith, lighting design by Mike Wangen). What struck me most about this play is that even now, nearly 100 years after the events take place and 50 years after it was written, the issues, conflicts, and arguments sound very similar to what we hear today, particularly in a climactic scene between Julia and Herman when they finally say all the things they've never said to each other. Namely, that Herman's people have enslaved, oppressed, and murdered Julia's people for centuries. Herman protests that his family are poor sharecroppers, and he never personally oppressed or murdered anyone, unable to acknowledge the privilege of his white skin. This is the same rhetoric we hear today, and not just in South Carolina, in the refusal to acknowledge privilege and the long history of institutionalized racism, which those of us with white skin have benefited from even if we're not the direct perpetrators. It makes me wonder, if we're still having these issues 100 years later, when will we heal? I don't know, but I do believe that theater can help us face our issues and talk about them more openly. 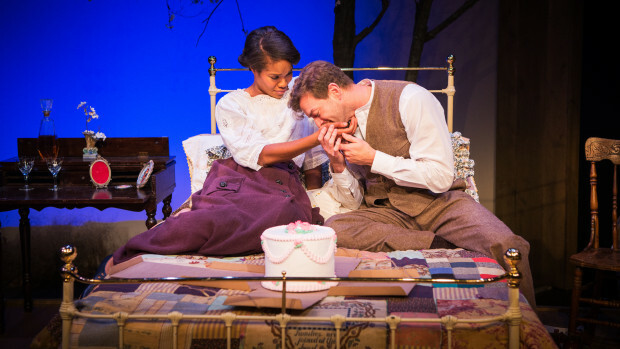 The beautiful, tragic, and timely Wedding Band continues at Penumbra Theatre through November 12.